Perched on a hill, the temple was built by king Walagambahu in the 1st century B.C. 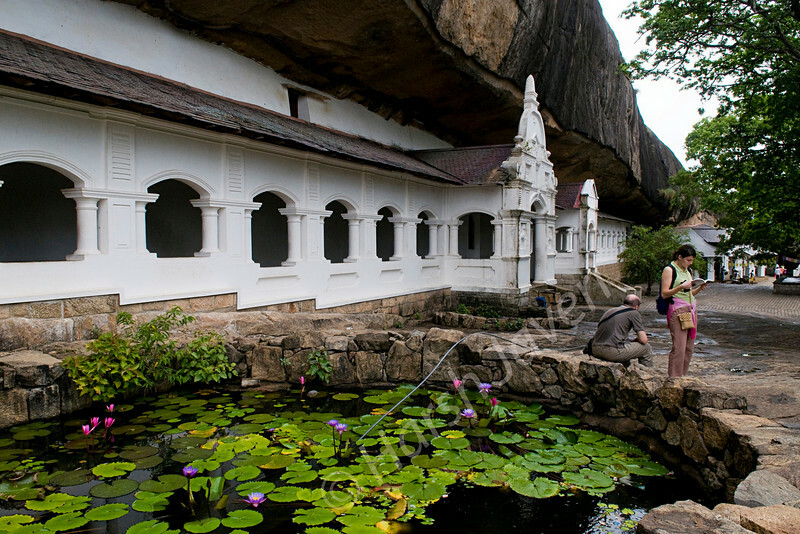 and is the most impressive of Sri Lanka's cave temples plus a World Heritage Site. The complex of five caves with over 2000 sq. metres of painted walls and ceilings, is the largest area of paintings found in the world. It contains over 150 images of the Buddha of which the largest is the colossal figure of the Buddha carved out of rock and spanning 14 metres.Hindu statues are believed to be of the 12 century AD and the latest paintings are of the late 18-century. Dambulla is a small town located at a distance of 19 km from Sigriya on the Sigriya-Kandy road. Dambulla has over 80 caves in the surrounding and some of them have been used by the monks as meditation locations. Lovely. Now that's a pond. Beautiful setting. I love the contrast of the color of the pond and lilies with the simplicity of the temple. What a beautiful place ! Wonderful color and contrast between the building and the lily pond. Beautifully captured. This is a lovely shot...nice comp to the shot. The colors of the lilies and the touch of pink in her clothing are a nice balance with all the green of the lily pads. Always enjoy 'traveling' with you!